Abstract: The Istranca Crystalline Complex in NW Anatolia and SE Bulgaria includes structural units that differ in lithostratigraphy, metamorphism, age and structural position. They are collectively named as the “Istranca nappes” comprising from bottom to top the Sarpdere, Mahyada˘g and Do˘ganköy Nappes. The Sarpdere Nappe consists of Lower Triassic arkosic metasandstones with slate interlayers, followed by Middle to Upper Triassic carbonates and an alterna- tion of Upper Triassic clastics and carbonates. The Mahyada˘g Nappe comprises a low-grade metamorphic Late Paleo- zoic—Triassic carbonate-siliciclastic sedimentary succession. The Do˘ganköy Nappe includes Precambrian?—Paleozoic metasediments, intruded by Late Carboniferous-Early Permian calc-alkaline granitoids. Its Triassic cover comprises metaclastics and metacarbonates. The Istranca nappes were juxtaposed at the end of the Triassic and transgressively covered by Lower Jurassic coarse clastics, followed above by Middle to Late Jurassic carbonates, black shales and carbonate-siliciclastic sedimentary succession. The phosphate concretions in black shales yielded radiolarian assem- blages indicating Late Bajocian-Early Bathonian, Early Bathonian and Early Kimmeridgian ages. These nappes and their Jurassic cover are unconformably overlain by the Cenomanian-Santonian volcano-sedimentary successions in- truded by Santonian-Campanian Dereköy-Demirköy intrusive suite. The preliminary data suggest that the Variscan basements of the Mahyada˘g and Sarpdere Nappes were juxtaposed prior to the Triassic and overridden by the Do˘ganköy Nappe of possible Rhodopean origin from S to N during the Cimmerian compressional events. 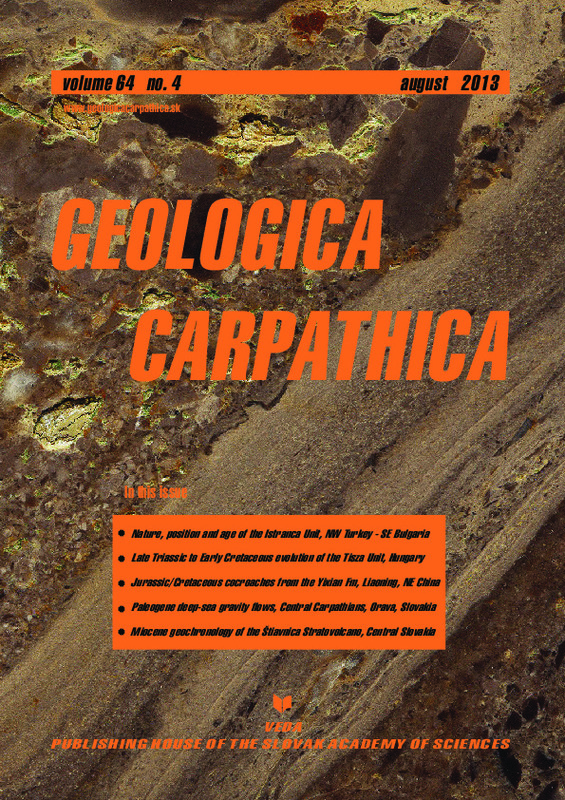 Abstract: The Upper Triassic—Lower Cretaceous successions of the Transdanubian part of the Mecsek and Villány- Bihor Zones of the Tisza Unit have been studied from the lithological, lithostratigraphical, sedimentological, microfossil and microfacies points of view in order to correlate and interpret the significant differences between them and to draw a conclusion about their geological and paleogeographical history. After an overview of the paleogeographical recon- structions of the broader area, the succession of the Mecsek and Villány-Bihor Zones and the debated Máriakéménd-Bár Range are introduced. Until the end of the Middle Triassic the study area acted as an entity. The first fundamental difference between the two zones can be recognized in the Late Triassic when marine carbonates were replaced by thick fluvial siliciclastics in the Mecsek Zone, while it is represented only by small, local lenses with a few and thin dolostone intercalations in the Villány Zone. The Mecsek Zone is bordered southward by one of the large listric faults to the north of which very thick siliciclastics developed in the Early to Middle Jurassic, whereas it is highly lacunose in the larger western part of the Villány-Bihor Zone. The break at the base is subaerial, higher in the succession it is shallow subma- rine. The sediment is silty, occasionally sandy crinoidal limestone of late Early Jurassic or even Middle Jurassic in age. The Upper Jurassic in the Mecsek Zone is composed of deep-water cherty limestone while in the Villány Zone it became a thick, shallowing pelagic limestone with reworked patch reef fragments. It is clear evidence that the Mecsek Zone had a thinned continental crust thanks to the nearby rift zone while in the Villány Zone the crust remained thick. The actualized version of the Plašienka’s paleogeographical model (Plašienka 2000) is introduced. Abstract: Although cockroaches were the dominant insects in various Paleozoic and Mesozoic insect assemblages, their general morphology was extremely conservative. One of the most common of them, the Jurassic-Cretaceous family Mesoblattinidae, is described here for the first time on the basis of completely preserved specimens. Ninety-two specimens of Perlucipecta aurea gen. et sp. n. reveal details of head, mandible, male tergal glands and terminal hook; cercal, leg and antennal sensilla. Its congener, P. vrsanskyi is described from the same sediments of the Yixian Forma- tion (Upper Jurassic—Lower Cretaceous). The forewing venation variability of P. aurea, analysed for the first time in this family is nearly identical (CV = 6.23 %) with variability of two species of family Blattulidae that occur at the same locality (CV = 6.22 %; 5.72 %). The transitional nature of morphological characters represented by asymmetry between left and right wings (simple/branched forewing SC and hind wing M) in P. aurea documents the phylogenetic relation between the families Mesoblattinidae and Ectobiidae. Abstract: The deep-water clastic systems of the Central Carpathian Paleogene Basin contain megabeds, which are devel- oped in distinctive stratigraphic horizons and can be traced over long distances. These beds are characterized by great individual thickness (4—13 m), uniform lithology and internal structures. On the basis of their lithology, sedimentary structures and sequence development, the megabeds are characterized by 15 individual facies and interpreted from the viewpoint of flow hydrodynamics. The grain-size distribution and internal structures of the megabeds point to their depo- sition from uniform turbulent flows. The main controlling factor for generation of such large voluminous flows is inferred in the sea-level changes, when a relative rising of sea level during the Eocene/Oligocene boundary was responsible for long-lasting accumulation of the clastic supply at the basin margins. The large volume of detritus from river discharge and ravinement surfaces of flooded land was accumulated on the shore and in the conduit heads where the sediment was remobilized by other triggers. The flows generated by catastrophic floods during the early Rupelian sea-level lowstand are thought to be the most probably triggering mechanism. The large highly erosive hyperpycnal flows from flooding rivers could erode accumulated deposits in the conduit or on steeper basin-margin slopes and could cause progressive increase of the sand volume in the flow. Conduit flushing appears to be the most probable source of sediment for the very large voluminous flows that were responsible for deposition of the Orava megabeds. Abstract: The Štiavnica Stratovolcano in Central Slovakia is the largest volcano in the Neogene to Quaternary Carpathian volcanic arc. A large caldera, an extensive subvolcanic intrusive complex and a resurgent horst with late stage rhyolite volcanites are the most characteristic features. The results of new K-Ar and Rb-Sr isotope dating using more sophisti- cated methodical approaches have changed our view on the timing of volcanic and intrusive activity. K-Ar dating of groundmass fractions combined with Rb-Sr isochron dating in the cases of possible rejuvenation has provided highly reliable results. The lifespan of the stratovolcano is apparently shorter than assumed earlier. Evolution of the stratovol- cano took place in five stages during the Early Badenian to beginning of Early Pannonian time: (1) construction of the extensive andesite stratovolcano during the interval 15.0—13.5 Ma; (2) denudation of the volcano concluded with the initial subsidence of a caldera and the contemporaneous emplacement of a subvolcanic intrusive complex of diorite, granodiorite, granodiorite porphyries and quartz-diorite porphyries during the interval 13.5—12.9 Ma; (3) subsidence of the caldera and its filling by differentiated andesites during the interval 13.1—12.7 Ma – volcanic activity overlapping with the emplacement of the youngest intrusions; (4) renewed explosive and effusive activity of less differentiated andesites during the interval 12.7—12.2 Ma; (5) uplift of the resurgent horst in the central part of the caldera accompa- nied by rhyolite volcanic/intrusive activity during the interval 12.2—11.4 Ma. Extensive epithermal mineralization was contemporaneous with the uplift of the resurgent horst and rhyolite volcanic activity and continued till 10.7 Ma.